This stark quote greeted us at the Gisozi Genocide Memorial Centre in Kigali. During our last week of training the CAC staff spoke often about the genocide, Rwanda, and it’s future. We wondered about how the genocide was still impacting decisions made today, and whether it was in the daily thoughts of all the citizens. 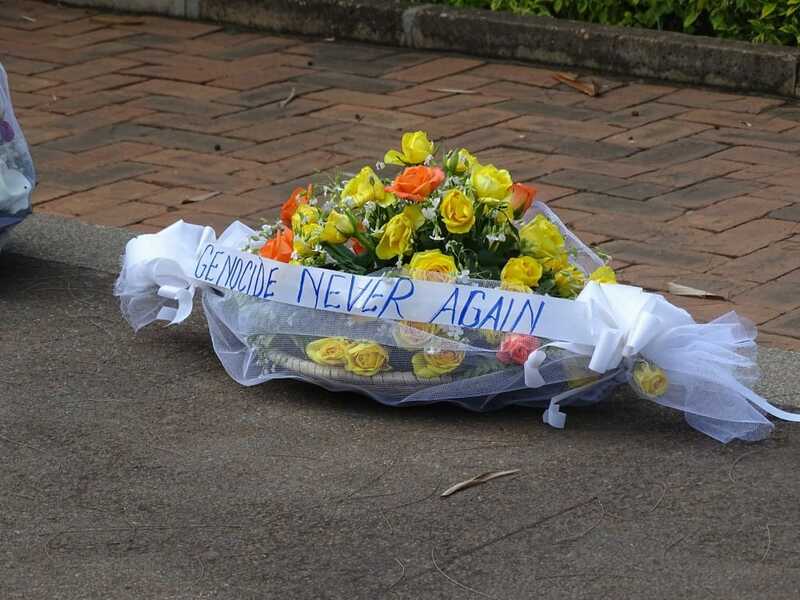 Instead we find ourselves coming to a slightly different conclusion: Rwanda is aware and respectful of its past, but more importantly it is looking to create a future where it does not happen again. In short, Rwanda is building the country they want to become. We see it in the progress being made in capital improvements and in the attitudes of the people moving forward in their daily tasks. Most especially, we see it in the commitment to a singular Rwandan identity instead of the tribal divisions that were a prelude to the genocide. This past week in working with over 50 coaches in Kigali we saw how the Rwandan community has moved forward and will continue to become the society they desire. One of the more notable moments of the week occurred Off-Field, in a meeting with the Ministry of Sport and Culture. They have embraced the ideas put forward by Football for Hope, Peace, and Unity along with CAC to develop a Rwandan specific curriculum that can be implemented by FHPU coaches throughout the country, in the schools and soccer community. This would include games that teach about Rwandan identity, conflict resolution, and understanding stereotyping and discrimination. But they would also include lessons on entrepreneurial skills, leadership, and communication. 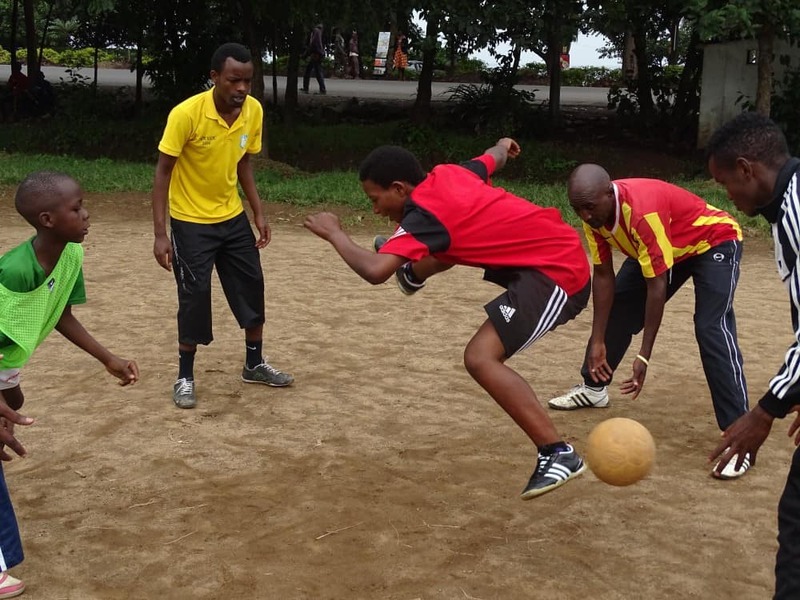 Along with FHPU, Rwanda has made the choice of what their future should look like, and is able to decide how sport can play a role in educating people about that future. Now, with the help of CAC, we will begin to develop this curriculum with the goal of implementation later this year. One game that will be included in this Rwandan curriculum is a game that Victor “Brown” Shyaka created for the final day of training. It was a game of possession between two teams in a large area, but there were also very small squares scattered about that represented safe spaces. Throughout the game, taggers (who represented threats to an individual or community) were released and you had to find a safe space. This game was to teach children about various potential threats and also where and when to seek the safety of places like your home, soccer field, or community center. 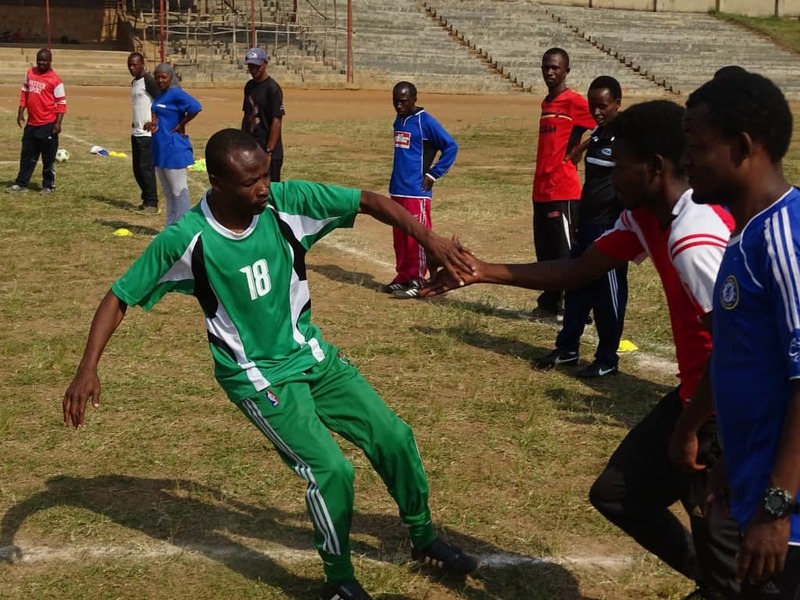 The coaches in Kigali, and throughout Rwanda, are becoming Self-Directed learners, capable of creating their own games and choosing their own future. The coaches, much like the country, is not quite there yet, but you can see the progress they have made and also how close they are to realizing their goals. It’s been a great month for CAC and FHPU in Rwanda! July 3, 2015. 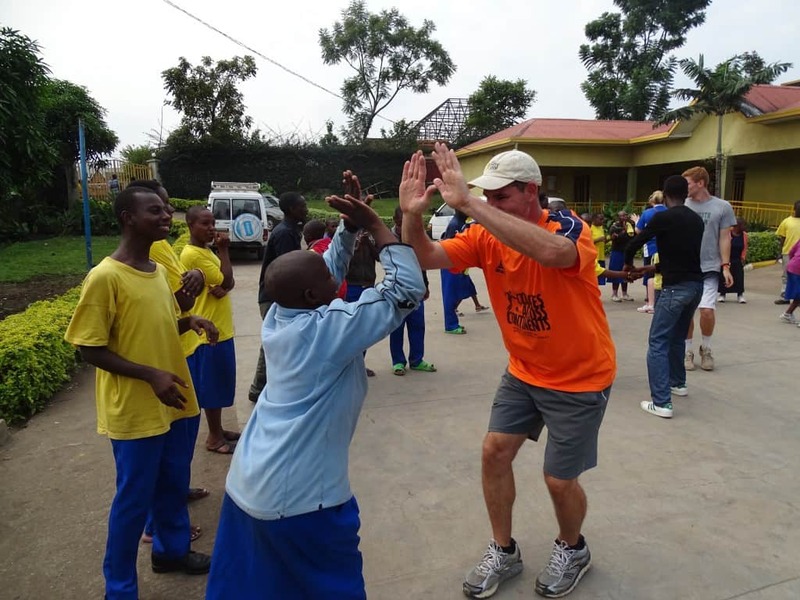 Long-time CAC supporter, advisor, and now volunteer-coach Jamie Reilly blogs about his first week On-Field with CAC and our partner, Football for Hope, Peace and Unity and their Sport for Peace ‘Play For Hope: Rwanda20’ Initiative. I wasn’t sure what would await me when I arrived in Rwanda. I’ve been fortunate to do some traveling in other developing areas in Africa. While incredibly rewarding, travel in these areas can be challenging and you definitely need to keep your wits about you. I’d also seen the film “Hotel Rwanda” about the 1994 genocide. Words can’t quite capture the brutal horror of those 100 days where over one million people were slaughtered in an ethnic cleansing of minority Tutsis (Tootsies) by the majority Hutus (Hoo-Toos). To say that my guard was up, is an understatement. My apprehensions and expectations, however, could not have been further than reality. The first thing I noticed was how unbelievably clean it is… EVERYWHERE. And I mean spotlessly clean. Main streets, side streets, parks, schools, homes, bus depots – you name it – everywhere seems freshly swept. Didier Bana, our wonderful host from Football for Hope, Peace and Unity (FHPU), told us that all Rwandans take great pride in where they live. To build unity, every neighborhood and village gathers on the 4th Saturday of each month to do service and connect with neighbors. Indeed, throughout Rwanda, there is a sense of collective commitment to a peaceful and prosperous future and you can see it and feel it throughout the country. Our first program was in Rubavu, a community about 3.5 hour drive on great roads from the capital of Kigali. There we worked with 64 coaches from local soccer clubs. This area in particular, has a very established academy system for training players in skills and tactics. It was exciting to see so many turn out to find ways to incorporate social education into their work with their teams. Over the course of the week we taught and played 26 different games that illuminated life skills, gender equity, conflict resolution, and health and wellness including HIV. An important element to almost every game is for players to use their voice. Early in the week, coaches were somewhat hesitant, but by the end of the week “muvuge cyane” (translation is loud voices) were echoing across the field on every game. My favorite game with this group was Messi for Gender Equity. For those that are unfamiliar with the CAC curriculum, there are different modules built around role models like Lionel Messi star of Barcelona FC or Perpetua Nkwocha former captain of the Nigerian women’s national team. Messi for Gender Equity starts with a brief discussion about different roles and positive qualities of women in Rwandan society. These roles and qualities are then selected by smaller teams of three who then are each called to meet other teams in small sided games. The competition was fierce and fun, but the best part was the discussion afterwards. We are lucky to have Dr. Holly Collision from Loughboro University (UK) with us for two of the four weeks in Rwanda. Dr. Collison’s research specializes in Sport for Development and Peace. In short, it was great to see a very male dominated group, make the connection that they as coaches can not only play a role in challenging limiting gender stereotypes. Another highlight was an afternoon trip to a local community center for the mentally and physically impaired. The welcome we received was one of the warmest I could remember. We had a brief tour of the different programs they run to help develop life skills, and then we played a few games with the students in the courtyard. As I zipped back to the guesthouse on the back of moto-taxi, I had a new appreciation for what fun can be. So many smiles and so much laughter! Finally, my post wouldn’t be complete without mention of Anike Ishemwe. We met Anike after the first session when we grabbed a cold water at a restaurant on the shore of Lake Kivu. 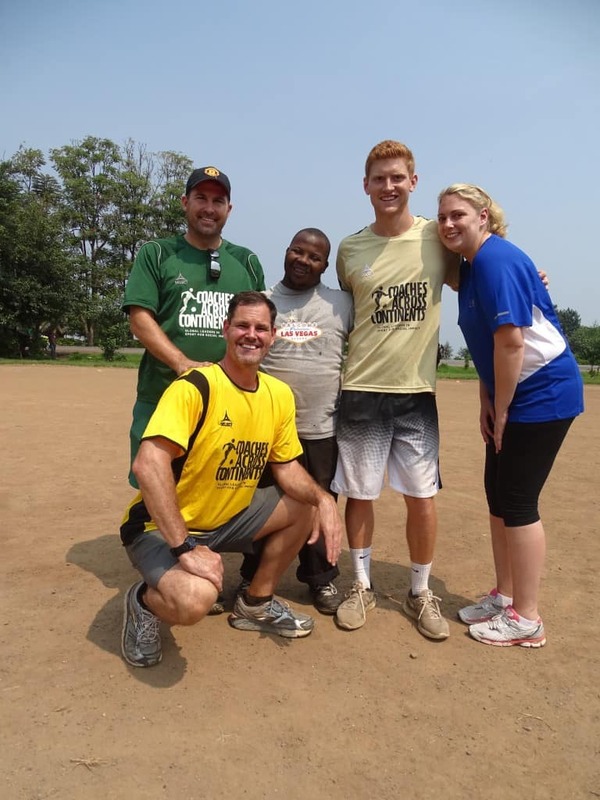 The next day, he was at the field joining in the games taking pictures, collecting scrimmage vests, and just helping keep a smile on everyone’s face. Anike has Down Syndrome, and must be the most popular guy in Rubavu. We were so pleased to present him with a certificate at the end of the week and welcome him as a Coach Across Continents! Almost forgot… in Kigali, we stayed at a place that has the only bowling alley in Rwanda! Playing Circle of Friends at the Community Center!